[This photo] appeared on the NY Times website front page on July 4th. 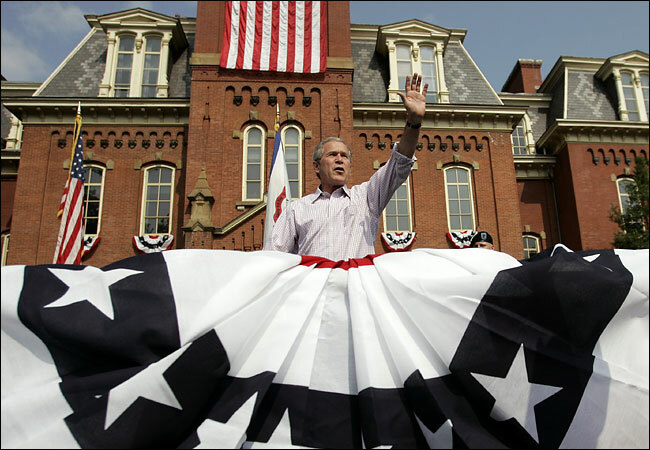 The most obvious effect is that of Bush appearing to wear a ridiculously over-sized skirt, banded at the waist with the red stripe. Note the saggy hello/sieg-heil salute. But perhaps more interesting is the absence of a right arm, amputated above the elbow. The flag just behind his right shoulder appears to replace that arm, in some way. The absence of a human backdrop, save the abbreviated eyes/beret of the soldier to his left, adds to Bush’s isolation and weird feminization. Finally, there is the odd angle, tilting upwards at the old Victorian mansard roof and red brick with elongated windows. No flag here, like Bush himself, is complete. The overall effect is of gothic and grotesque judgment. A brilliant photograph. Last night I saw David Hare’s play "Stuff Happens" about how the Bush administration (in tandem with the Blair government) lead us to war. I thought the psychological depiction of Bush (played by Keith Carradine) was an interesting one. While effecting the stubborn stance of a guy who always makes the tough decision, I saw a picture of a man who — in the face of someone pitching him a strong argument — seemed less able, then willing to engage. When it came time to make the tough decisions, it seemed that those with the most proximity (primarily Cheney, and Cheney surrogates Rumsfeld and Wolfowitz) won out by appealing to Bush’s macho persona and his ideal of decisiveness. Perhaps the idea of Bush in a dress is so powerful because people intuitively understand that Bush is so pliable. He has no internal compass — except the one which functions by default, guided by the Christian coalition and the hawks who have so cleverly "gotten his number."